This entry was posted on Wednesday, January 23rd, 2013 at 4:27 pm and is filed under EDCI 506, Teaching Philosophy. You can follow any responses to this entry through the RSS 2.0 feed. Both comments and pings are currently closed. I enjoyed reading your post, especially because you mentioned addressing your student’s different learning styles. I believe that every teacher needs to be knowledgable on the different methods of teaching, as teaching out of a textbook and by lecture is not the best way. There are many sources for different teaching methods. I love it when teachers get creative and use songs and art and reading and writing; I can learn the words of a catchy song better than memorizing facts so I am sure it is no different for children. Good post, thanks! I think this was very clearly thought out I enjoyed the specific teaching ideas. I know that in my own experience there was not a lot of variation to teaching. We were taught mainly from textbook readings, end of chapter questions, notes on projector, etc. I’m hoping to learn a lot of newer and more engaging techniques in the classes I am taking now. I enjoyed hearing some of the more engaging techniques you know. 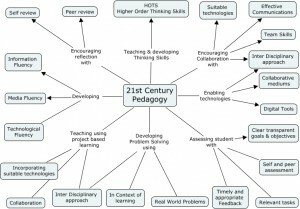 I especially liked the concept map for 21st Century pedagogy. Thank you for sharing your information.